Directions: You will be given an exam covering knowledge needed to drive safely. The test will consist of 30 multiple choice questions of which you can only miss 6 questions. All the questions are based on information contained in Section B of the manual. You can expect questions about Traffic signs and signals, Safe driving principles, Rules of the road, Drugs and alcohol. In order to encourage the applicant to thoroughly stu Section B of the manual and cut down on repeat visits by applicants who are not yet prepared for the examination, a mandatory 7-day waiting period is required after failing any driver license knowledge test. Drive at the posted speed. Because your tires will not grip the road under wet, snowy, or icy conditions as well as they will under dry conditions, you should slow down if the roadway is wet or icy. They may use the left lane. They may cut through all lanes. They may wait on the side of the road. You should expect to see bicyclists driving with traffic on the road. You should not be surprised to see a bicyclist using the left lane when turning. Even if the signal is green, you must not enter an intersection unless you can get completely across before the light turns red. If you block the intersection, you can be cited. What is an important step in turning? Check traffic in all directions. Always move to the left lane. When turning, you should look to the rear and both sides of your vehicle to ensure it is safe to proceed before making the turn. Adjust your speed to safely complete the turn. Watch for traffic merging from the right. 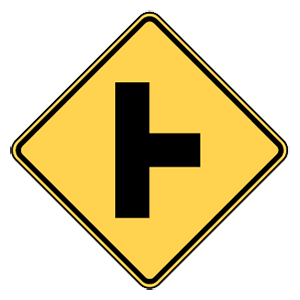 Warning signs alert drivers to upcoming hazards and are usually yellow with black markings. 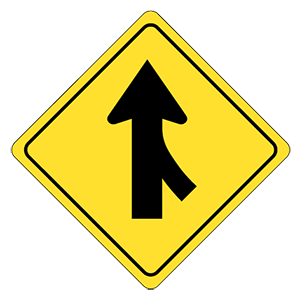 This sign warns drivers about potential traffic merging into their lane from the right. Separate lanes of traffic moving in the same direction. Separate lanes of traffic moving in opposite directions. Yellow lines separate traffic moving in opposite directions. Dashed lines on the pavement indicate that passing is permitted when safe.